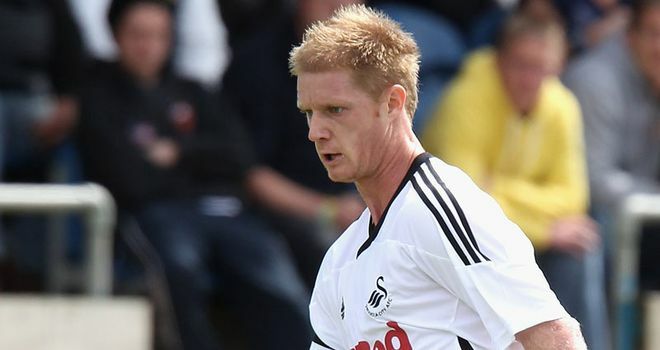 Swansea defender Alan Tate is using an oxygen chamber in a bid to speed up his recovery from a broken leg. Tate was expected to be out of action until Christmas after sustaining the injury in a bizarre golf buggy accident last month. The 29-year-old is keen to make a quicker than expected return to action and is spending three one-hour sessions in the chamber a week to try and aid his recovery. Tate believes that with the help of the treatment he will be back in action well ahead of schedule. "The oxygen chamber is supposed to help the healing of the bone," said Tate. "The club asked me to do it and if it helps me, then it's something I wanted to do and something that has to be done. The enclosed area doesn't bother me and I'm not scared of anything. "I go into the chamber three times a week for an hour. "I've done 10 sessions and the results so far say it is helping and speeding up my progression. "I've come to terms with the injury and accepted what has happened. As well as the chamber, I'm getting back into the gym to build up my strong leg."